K. W. Homes builds on your property or ours. We will help you select the ideal location for your home or build your custom home on one of our pre-selected sites predominantly in Northwest Florida and South Alabama. K. W. Homes strives to listen carefully to our clients vision and create custom homes that reflect their own personalities and lifestyle. While we tend to incorporate a southern traditional style paired with modern day conveniences, we enjoy building all styles and love to create new concepts with our clients. Our portfolio includes a wide variety of architectural styles, home sizes and materials. Please see our Portfolio for inspiration. What do your homes cost per square foot? A true custom home price is not defined by cost per square foot. This question is a very difficult to answer for custom builders, just as, “how much does a new car cost?” or “how much does it take to send a kid to college?”. There are many variables that go into the cost. However, at K. W. Homes, we strive to understand your budget, and deliver your true custom experience within the parameters you provide. We have a specific budget. How can we be sure we'll not go over budget before we start our new home? K. W. Homes will provide you with a detailed proposal. We will review the proposal thoroughly with you to ensure we have included all of the features you have requested. Those clients that adhere to the original set of features do not typically go over budget. Clients that choose to add features and make changes throughout the process generally exceed their budget. However, at K. W. Homes, we communicate throughout the process and make you aware of any additional costs BEFORE a feature is added or changed. K. W. Homes averages 25 homes per year. With a limited number of home starts per year, we are the right sized builder to offer our clients personal attention while offering the best value from our subcontractors and vendors. Do I have to choose one of your plans or can you help me develop my own plans? 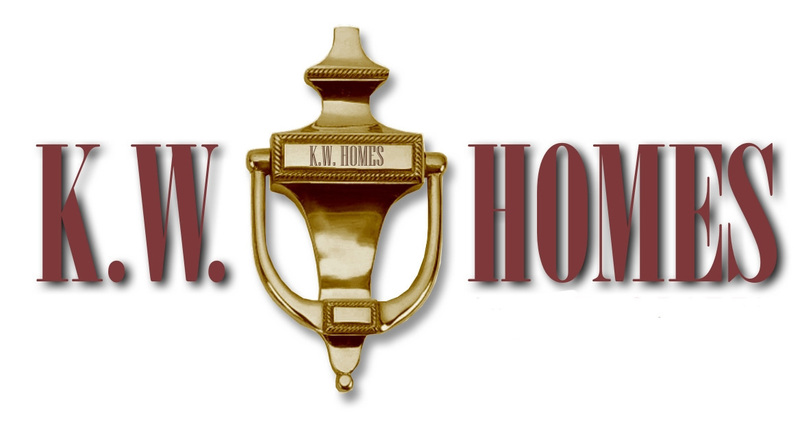 K. W. Homes is a true custom home builder. We will take your vision or a plan that you’ve been dream of building and put it on paper. Often, our clients will identify a design in one of our many plan books and work with us to modify the layout, dimensions and square footage to meet their lifestyle needs. Do you have a home or homes I can see finished or under construction? K. W. Homes typically has twelve or so homes under construction at different stages. We are always happy to meet on site and give folks personal tours and answer questions. What is the average time frame to design-build a true custom home? There are many variables that go into the answer of this question, but without going into all of them, I’ll simply say on average it takes 180 days to complete a new home.